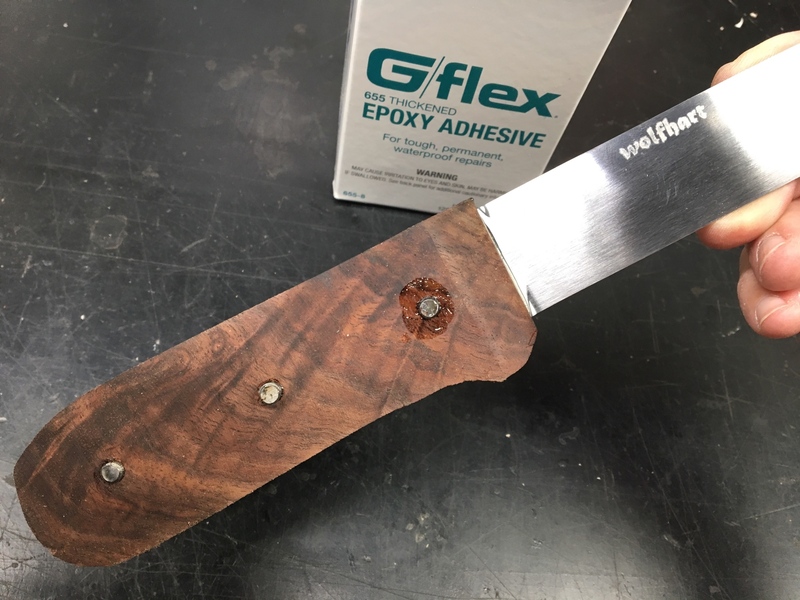 Early in the Colclesser Project WIP thread, wolfy referred to the knife he wanted as "Wolfhart" and we've called it that ever since. 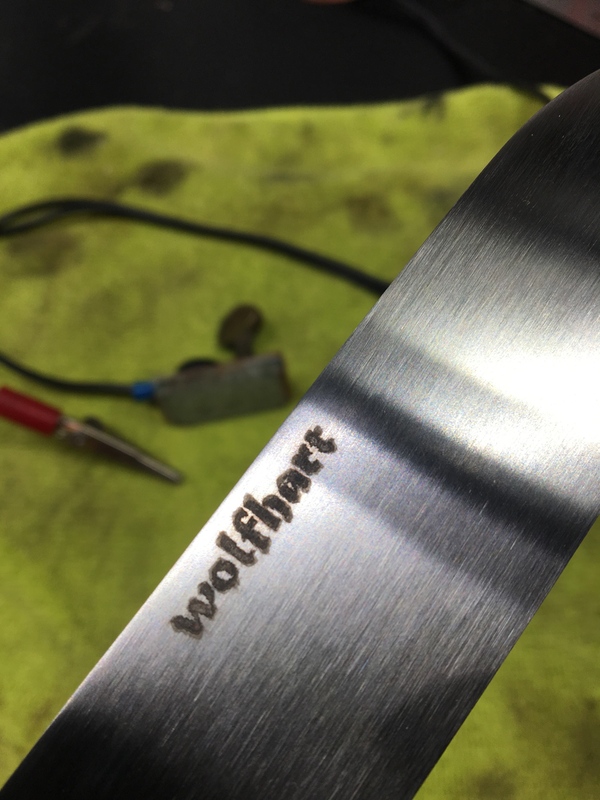 I've sent wolfy and others photos of their knifes in progress but they usually end up in several different PM's. Wolfy asked if I could put his in a thread and I'm happy to oblige. I'm not sure which is Wolfhart but it is in this stack. 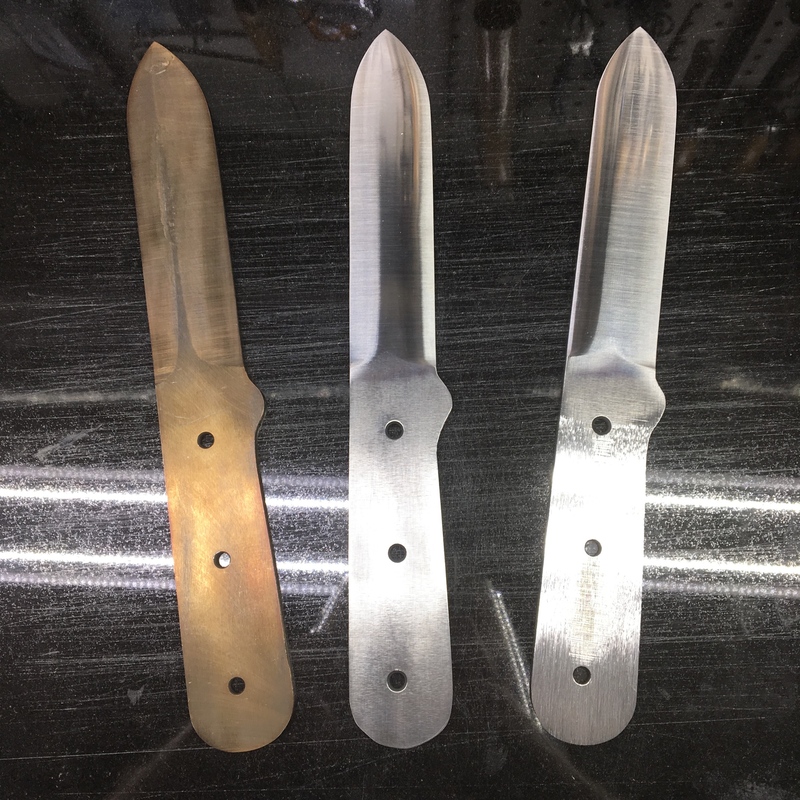 This is the first batch of one dozen blades. 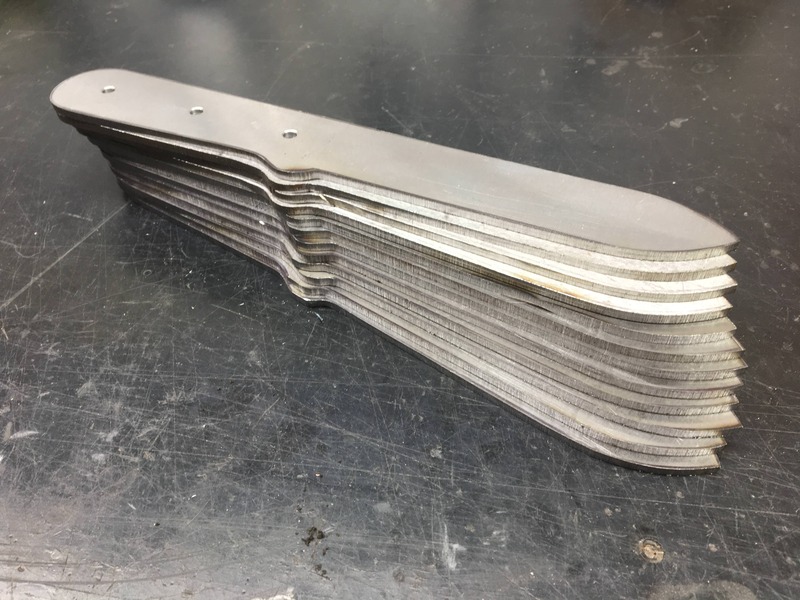 I did some flat grinding before sending them to HT. On the left is how they looked when I got the back. Center and right are with convexing in progress. I think Wolfhart is in the center ... I think. After convexing (4 bevels per blade), I tapered and hollow ground the tang. 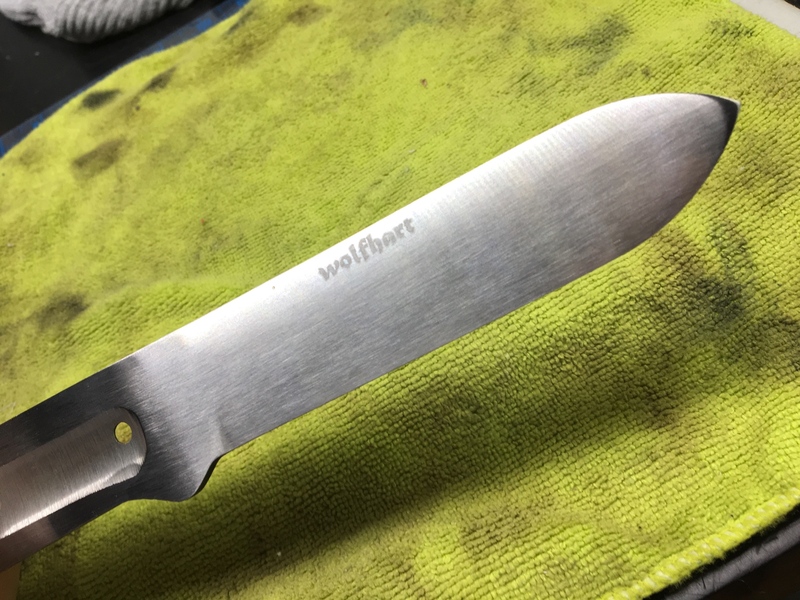 Wolfhart after grinding, tapering, hand sanding, Scotch-Briting, etc. While working on this one, I ended up buying a Brother Label Maker. It's a P700 I think. It connects to a PC and stencil tape for electro-chemical etching is available. We played around with a couple graphics but the resolution was too low. It etches text pretty well. This is the moment the Wolfhart came to exist. The figure really danced in the sunlight. I added a small spring clip to the belt loop so wolfy can clip it into the pocket of his bibs. Well, that's about all, wolfy. I do, too, Stan......and I'm itching to comment, but Heather wants to watch a movie now, so SWMBO is coming into play. You all know how THAT goes. I will comment, Wow thats looks great. I bet it cuts even better. Can't wait to play with mine. Nice. Yours has the most striking grain in the scales that I can recall seeing so far. Looks cool. Also, perhaps the longest movie I am aware of. They are pretty aren't they? 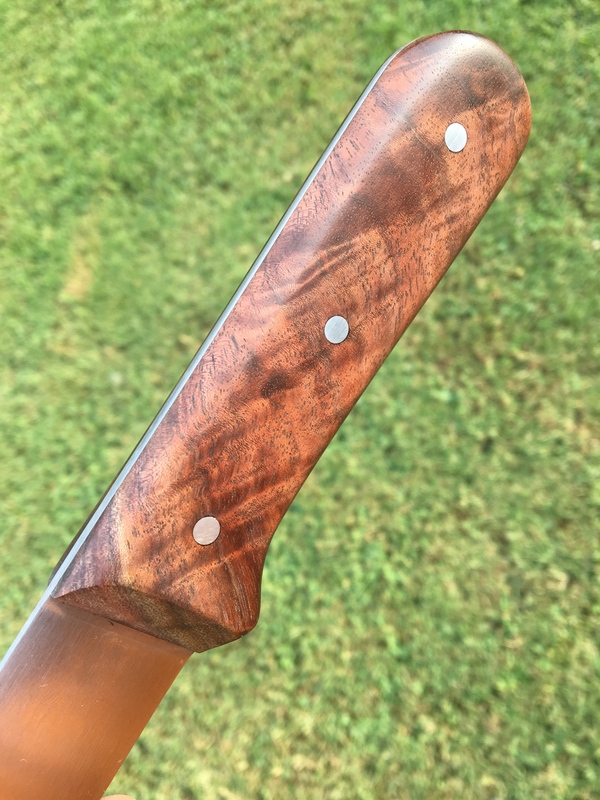 When Mike asked me if I wanted to go with straight-grained walnut or a piece of some nice burl he had, I have to admit that I kind of struggled with the decision. As we all know, the original had straight-grained wood of some kind. There is some dispute over just what wood that is, I guess.....speculati on by those that have seen the original lean toward chestnut or walnut. Without whittling a sliver off the original for testing there really is no way of being certain, but I doubt that Ethan will ever let that happen......if it were yours, would you? 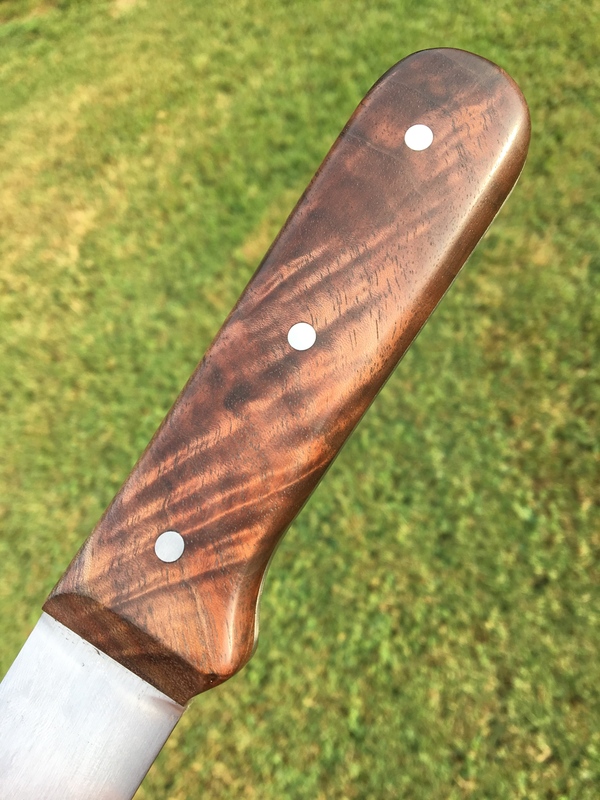 Since this is such a 'simple' knife, I decided to go with the burled walnut. Nobody around here knows anything about the Colclesser knife, anyway or even who Horace Kephart was, for that matter. Like Sarge said when he first PMd the pictures to me, the pictures don't really do it justice. No matter which way you turn it, the deep highlights change with the angle of the light. From dark to iridescent......it's like a light show, man! FAR OUT! I have been using the knife for a little over a month now and it performs well.....better than I'd expected, actually. I've whittled and cut some wood with it, but I knew it'd do that....where I wanted to see how it would perform is in the kitchen, where Horace no doubt used his the most. Its convexed profile really shines there.....potatoes and carrots both slice nicely. Those two vegetables are hard to cut precisely without a blade designed correctly for the task. Potatoes stick to the sides of a flat-ground blade like suction cups and that doesn't happen with the Kephart. Carrots are brittle and difficult to julienne without a properly ground blade and again, the Kephart performs beautifully. I usually diced onions with my Opinel, but since I received this knife I've been using it for that job. It actually works better on the big Vidalias than the #8 Opinel because of its length. It slices summer sausage & smoked turkey breast into wafer thin slices and it is easy to produce uniform, straight cuts. We haven't baked any bread yet this Fall, but I'd wager that it will work well for that, too. We even cut the cheese with it.....Gouda and aged cheddar, that is. Maybe I'll get to tell you all how it works on a deer in November when The Yuma Kid comes back for my guide services. EDIT: Oh yeah, almost forgot.....WOLFY APPROVED! I have also been using mine in the kitchen more than out in the woods. 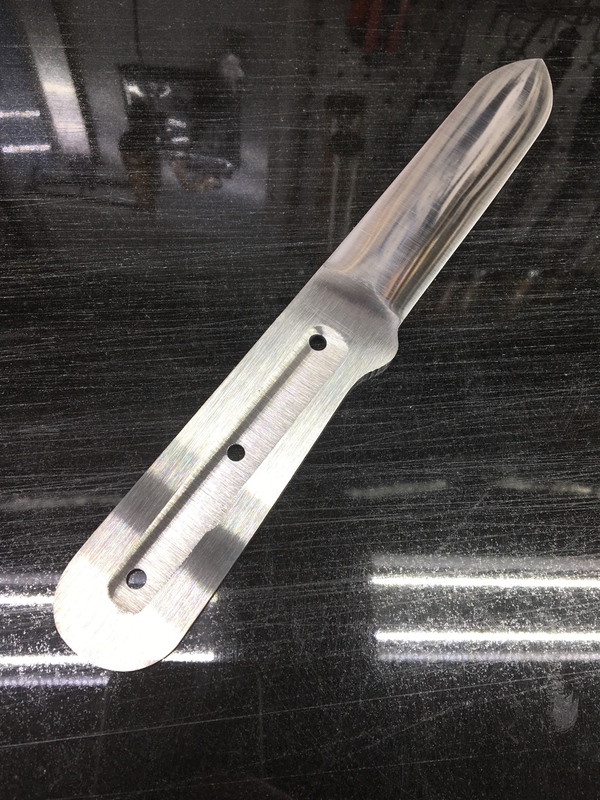 It is terrific for any food prep chores we do, from slicing the vegetables to trimming the fat off of a steak or roast. It has held its edge well as I have cut a bit of wood into fire sticks and used it like a draw knife on a piece of diamond willow. When, and if, I either get the big buck that hasn't showed up yet during this archery season or a couple of does during rifle with my muzzleloader we will see how it guts and skins game. I went with straight grain when discussing it with Mike. 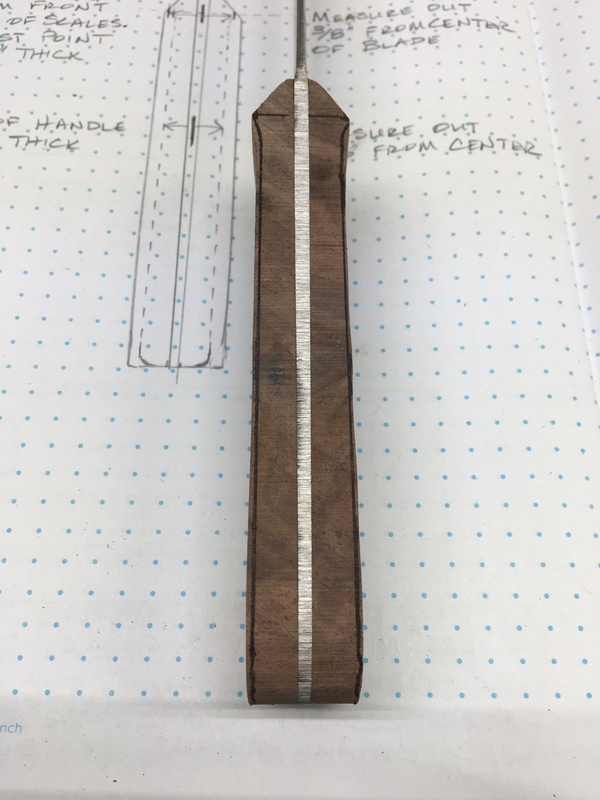 He had a piece of straight grained walnut that had been stabilized. I am very happy with it, both with how it looks and how the heavier wood feels in hand. 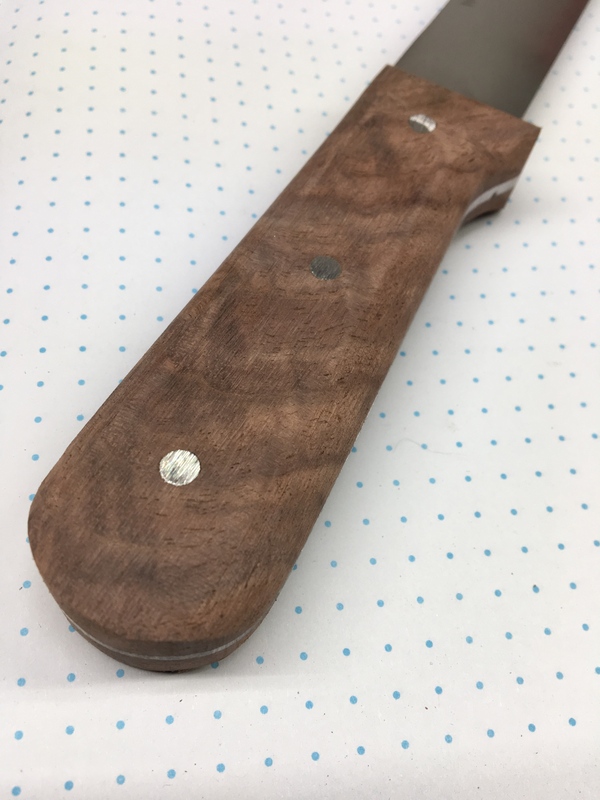 I like fancy wood too but for this knife I wanted it to be much like the one in the museum. 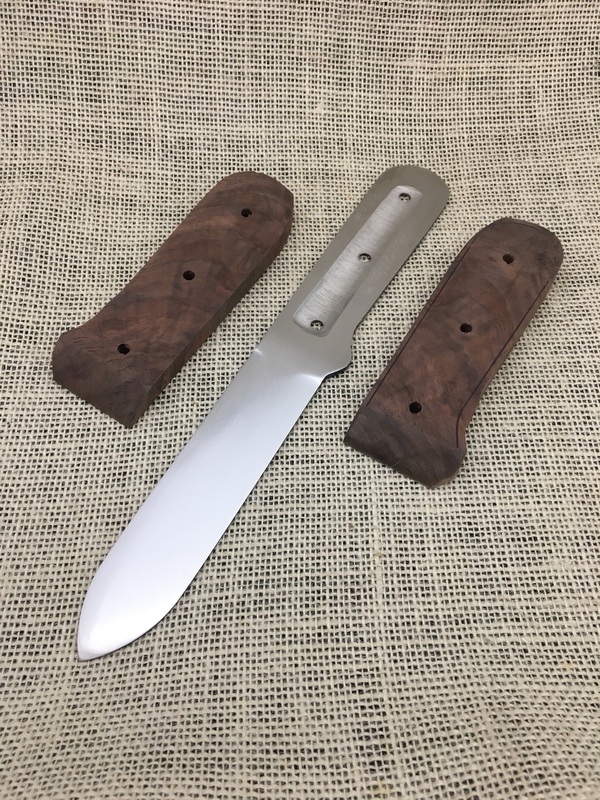 Kephart would have done well if he had one made with antler scales as they would be pretty nice on this blade. The knife has had time on my belt the few days I have hunted during the current archery season and it makes me smile a bit. It is just a feeling one gets about something special when you know who made it and what its design origins are. 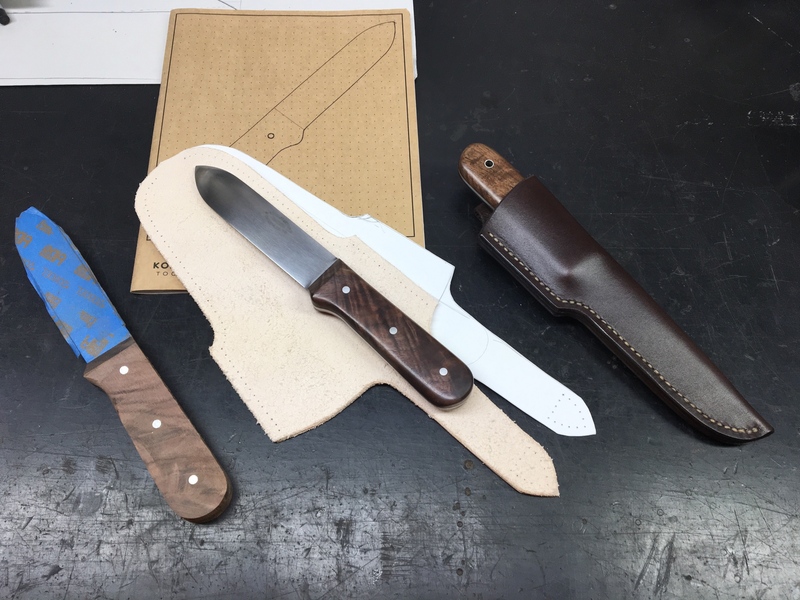 Mike did a terrific job on these knives. They are both WOLFY approved and KEPHART approved. He said "cut the cheese". Hehehe. Great to hear you guys are using and enjoying them. Thanks for the feedback. I hope you get to test them on big game soon. Please let us know how they do. I put scales on Spyder's this morning; should have his finished in a few days. Then Mannlicher is next in line. Just a couple left out of this first batch of a dozen. I guess I'll finish and keep one for myself. 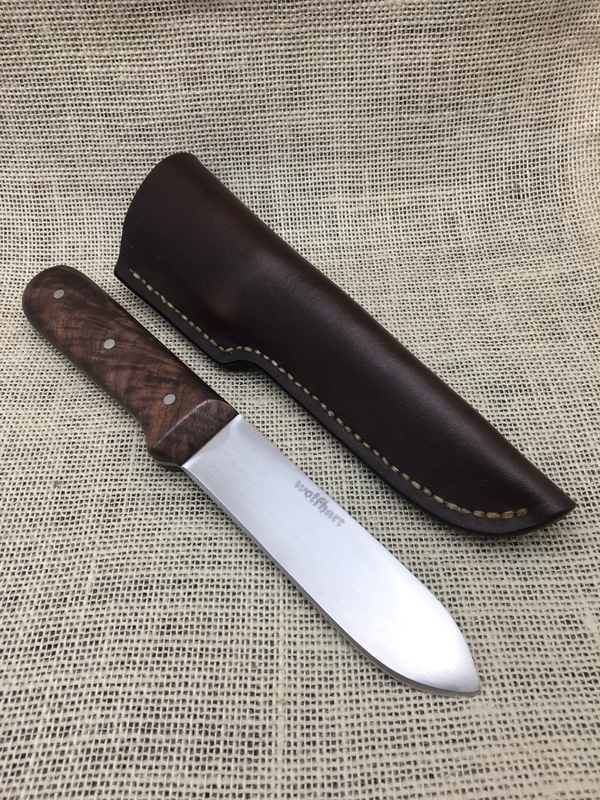 I'm still using one of the sawbalde knives in the woods (and the kitchen, too). 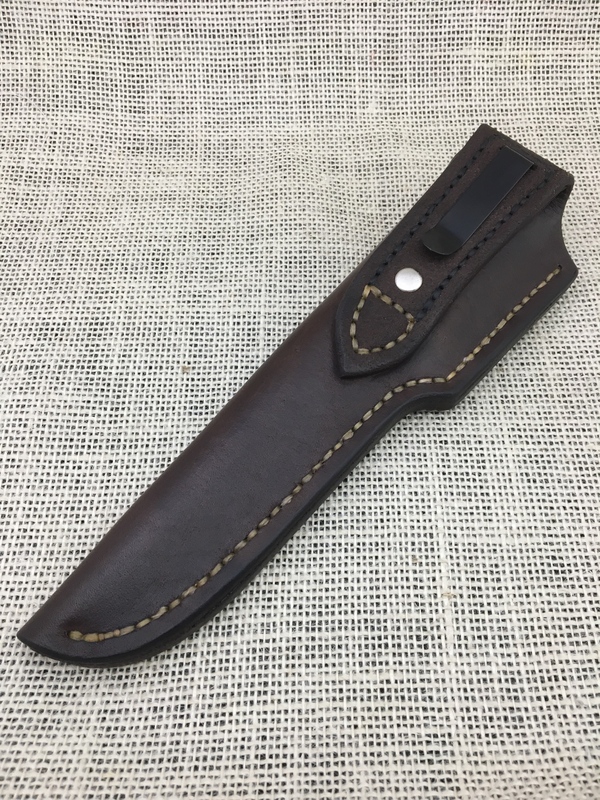 One other thing I'd like to comment on.....if you refer to the final picture in the series you can see the great job of integrating the spring clip that I asked Mike to incorporate in the sheath he made for me. Since I wear bibs almost all of the time, I don't wear a belt to slip through the belt loop. It doesn't really make much sense to make a sheath without one though, so I requested the boot-knife spring clip be added to the back of the loop so I could clip it to the inside top of the bib on my overalls. Mike went 'above & beyond' in providing that convenience for me, too....he not only added the clip, but sandwiched it between the loop itself and a nicely stitched and skived piece of leather on the inside of the loop. 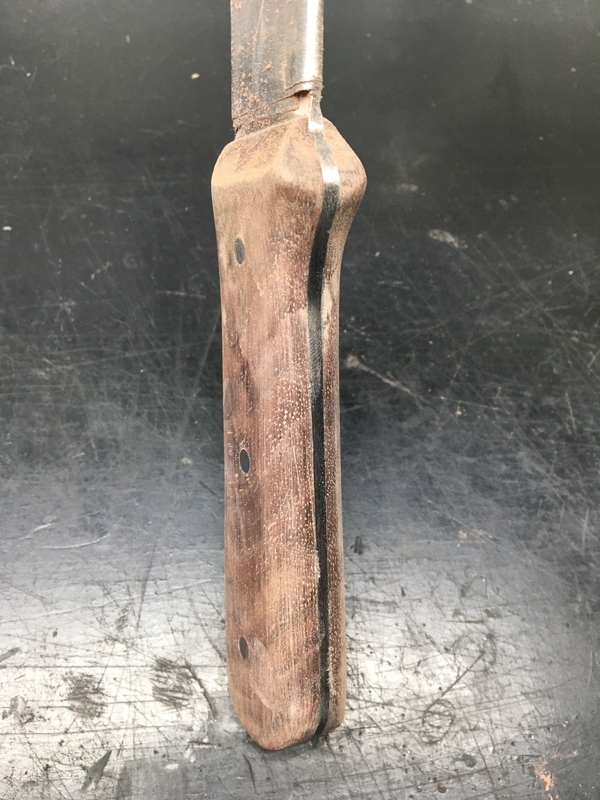 The result is having the convenience of a neck knife without the problems of a belt knife getting in the way when riding in the seat of the pickup or a dangling sheath getting in the way when I bend over and having to use two hands to sheathe or unsheathe it. Another nice thing in carrying it the way I do mostly hides it from view.....a good thing when carrying it when out in public places. Only the clip and the very end of the handle are visible when wearing it clipped to the inside of my bibs. Nobody even notices that I'm carrying it this way.....plus, it doubles as a very stylish, clandestine & covert farmer camouflage!